Does a missing tooth (or teeth) make it embarrassing for you to smile, as well as difficult for you to eat and speak? Dr. Wei can provide you with a new tooth and a complete smile makeover with porcelain fixed dental bridges. Who Needs a Porcelain Fixed Dental Bridge? Any tooth that is missing in your mouth leaves an obvious gap. The remaining teeth then have the freedom to move about and fill that space because they are not properly supported. Several missing teeth leave behind a portion of the jawbone that is understimulated, which alters the strength of your jawbone and can, over time, change the shape of your face – and not in a good way. 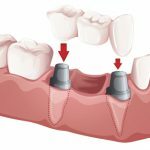 While porcelain tooth crowns are usually used to repair just one damaged tooth at a time, crowns are typically included as part of the dental bridge solution. The crowns serve as anchors on either side of the bridge, holding the bridge in the mouth and resolving the problem of a severely gapped smile. When you have one or more missing teeth, a porcelain fixed dental bridge is often one of the best solutions you can receive. In some cases, a dental bridge is an even more appropriate option than dental implants depending on the state of your oral health and the condition of the rest of your natural teeth. Dr. Wei will present all viable options to you at the time of your consultation so together you can decide what will work best. Aesthetically speaking, a bridge is an understated restorative dentistry solution. People are unlikely to notice that you are wearing a bridge because of the way it is positioned in your mouth. There will be no metal peeking out, no high lip line showing the metal collar of a dental implant. Dental bridges simply get the important jobs done without being obvious about it. As far as function goes, a porcelain fixed dental bridge will ensure that your smile is once again secure. You can feel comfortable speaking, eating, biting, and chewing without worrying about the solidity of your teeth or feeling self-conscious about the holes in your smile. In addition, because a bridge is bonded in place, it is not removable, which will give you an even greater peace of mind. How Does the Porcelain Fixed Dental Bridge Process Work? A porcelain fixed dental bridge is generally recommended if you have one or more missing teeth in a row. A fixed bridge “closes the gap” by adding a new porcelain tooth (or teeth) with hidden clasps to secure them in place. The dental bridge fits into the gap left by the missing teeth and attaches to dental crowns – also known as an abutment – on either side of the bridge. This treatment provides a double layer of security for your teeth, and makes you feel confident about the condition and appearance of your smile. The artificial tooth in a dental bridge is known as a pontic, and the crowns which anchor the bridge are sometimes referred to as caps. Both the bridge and the crowns are bonded in place. This procedure eliminates any holes in your smile and restores teeth to fully functioning. Obviously, porcelain bridges are made using porcelain, but just like dental crowns, porcelain bridges can be composed of several different types of materials, such as metal or zirconia. Traditionally, porcelain bridges are made from porcelain fused to metal or to ceramic. Ultimately, the goal behind the composition of porcelain bridges is to create a restorative dentistry treatment that is so strong and secure it will strengthen and support the part of your mouth where there once used to be a tooth or teeth. The bridge and supporting dental crowns are created to match your natural teeth in size, shape, and color. How Long Does a Porcelain Fixed Dental Bridge Last? With proper care, a porcelain fixed dental bridge can last for 15 to 20 years. When you think about the special occasions, meals, social functions, speaking engagements, family events, professional opportunities, and job responsibilities that could occur in your life over the next two decades, can you imagine being present with a mouthful of missing teeth? A bridge removes any possibility of embarrassment while speaking, eating, laughing, or smiling. Your confidence will be restored and you’ll know that when someone is looking at your smile, they’re doing so because they’re admiring it, not judging you for an unhealthy looking set of teeth. How Do I Take Care of Porcelain Bridges? Just because you have prosthetics taking the place of missing teeth and capping the adjoining teeth does not mean they maintain themselves. While the bridge and crowns do not need any special treatment, it is still essential that these teeth be brushed and flossed just like your natural teeth in order to ward off decay or other tooth and gum problems. Be sure to keep up with your preventive care visits to your Manhattan restorative dentist. These exams and professional dental cleanings will ensure that your bridge and crowns, and any other restorative or cosmetic dentistry, is properly in place and functioning as intended.